This weeks theme is “Transitions” and our hostess Karen Owen created this amazing arch. What do you think of when “transitions” is mentioned? Day to night, warm to cold, childhood to adulthood, one color to another – we would love to see your creations in gothic arch form here. I started on this crazy mixed media art journey about 7 or 8 years ago after a trip to Hawaii. When I came home, I started looking for ways to memorialize the trip by scrapbooking and photo art quilting. While I was making the scrapbook, I bought several rubber stamps. I wasn’t very happy with my results. So I started thinking that there must be a better way to use them. I bought Suze Weinberg’s book, The Art of Rubber Stamping. The first weekend after I had the book I did almost every technique described! I was hooked! Later came altered books and collage. I still use rubber stamps, still occasionally quilt, and I enjoy using Photoshop for digital art, but my passion is collage. I like to combine painting with images to tell a story. I have chosen “Transitions” as my theme for this week. I interpreted it as the transition from winter to spring, but it could be day to night, warm to cold, childhood to adulthood, one color to another — I can’t wait to see how you interpret this theme. Wonderful Theme. Here is my arch. That’s why they’re called challenges:) This one was! Thanks for playing with me this week. Here’s my entry. here is my arch for today. My entry for this week, a tough theme. Great challenge, thanks and have a great week! this one really stumped me. I knew all the things I wanted to make – but ended up with this arch as the end result! My entry for this week, Thanks for looking. Here is my Transitions arch! Karen, thanks for the encouragement to try this, here is my “transitions” entry. This was a toughie!!! Here’s my piece. Wonderful theme! Beautiful artwork, Karen — just fabulous. Mine is posted — http://art-interrupted.blogspot.com/. Here is my arch. The 1st one I ever made. Not an easy theme but that made it into a real challenge! I love your arch Karen! It’s beautiful. This theme really spoke to me, so I did a whole series of them, thinking about all the transitions going on in our family right now. I only found this challenge today. This was a tuff theme for me. Finally, I just let my scissors and paper stash take over while I watched the creative process. great theme, here’s what I made of it. At last I have finally finished my arch for Transitions. Found this really hard but what a great theme. Here it is, thanks for looking. Here’s my arch for transition. 1- Can I make the arch any size I like and design my own arch shape? 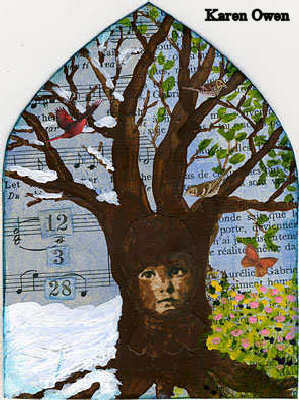 2- Do I have to use all 3 mediums rubberstamping, collage, vintage photos? can I just use 1 or 2? or can I decorate my arch in any materials I want? I had a crazy week at work and finally got my daily art posted and scanned today. I made to arches for this challenge. Had a lot of fun doing them~thanks for the inspiration!